This will be where I post my reviews for the alphabet marathon. I will probably get around to watching my first film later today. Plot: Two mutants come to a private academy for mutants whose resident superhero team must oppose a powerful mutant terrorist organization. Out of all the superhero franchises the X-Men has always been one of my favourites. This film is the first of a trilogy and while I think it is a decent superhero film it would never be up there with what I consider the best superhero films. I think it does introduce the characters well, and while I love all the times in the school I just feel that the final 20 minutes or so of this film is very predictable and conventional. I think this trilogy is cast very well, Hugh Jackman seems like the perfect Wolverine and Ian McKellen is eerie as the antagonist Magneto. Also, Famke Janssen who is an actor that I love, being cast as Jean Grey who is my favourite of the X-Men is one of the reasons I love this trilogy so much. This offering may not be a fantastic stand-alone film but when viewed in the trilogy everything comes together nicely. I think one of this films highpoints is the addition of having Mystique on the team. While her relationships with other characters in the film may not be quite canon to the comics she is still a fantastic villain and adds a feeling of uncertainty to many scenes. In the end we are never quite sure if the person we are seeing is really them, or if it is her and that added a great layer of mystery to the film. Plot: Remy is a young rat in the French countryside who arrives in Paris, only to find out that his cooking idol is dead. When he makes an unusual alliance with a restaurant's new garbage boy, the culinary and personal adventures begin despite Remy's family's skepticism and the rat-hating world of humans. Pixar’s legacy of extremely high standard filmmaking is held high in Ratatouille. You can’t help but wonder while watching this film, just how did they come up with this idea? 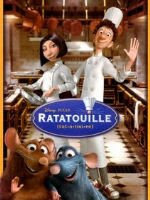 The idea of a rat cooking for humans in a kitchen is something I believe not many could pull off as a successful film. This film is essentially about art, and is a film that I believe to be one of Pixar’s most sophisticated, which is quite an achievement considering it is a film about rats. It may not have quite the emotional punch of some other Pixar films but the heart and soul within this film is undeniable, and provides a ride that is at times rather slow-paced, but never for an instant dull. The film is beautiful, much of which is credited to its location of Paris, France. One of the many things I love about this film is how the city of Paris is portrayed. We see the glory and stunning beauty of this city without ever having it thrown in our face. Yes the Eiffel tower can be spotted in the distance in a couple of shots, and once or twice the corner of the Notre Dame can be seen, yet unlike many other films set in Paris these famous landmarks are not thrown in our face. This means that while Paris is the setting of the film, the film is not about Paris which lets us concentrate on the story. Michael Giancchino provides an immaculate original score for this film which not only captures the spirit of France, but really pulls the audience into the various settings of this film, so much so that you can almost smell those delicious looking meals on screen. And the food does look marvelous, before seeing this film I would have found it hard to believe that animated food could ever look so mouth-watering but Pixar have once again proved that within their medium, anything is possible. Plot: After Bella recovers from the vampire attack that almost claimed her life, she looks to celebrate her birthday with Edward and his family. Cast: Kristen Stewart, Robert Pattinson, Billy Burke, Anna Kendrick, Michael Welch, Taylor Lautner, Ashley Greene. Okay, so we all know I am somewhat biased towards this entire series and that will most likely show in this review, but just hear me out and you will begin to understand why I detest it so much. First of all, I know this film is about supposed immortal ‘non-vampires’ but that shouldn’t mean that the audience has to suffer through hours of nothing happening. The first hour and a half of this film is so unbearably boring. There is no character development, no subplot, no main plot, no action... basically nothing at all happens. While the direction in this one may be... different to its predecessor Twilight , the acting has certainly not improved. It seems very simple to get a role in this film, if you are a male and have 6-pack then you are in, if you are a female and can act painfully bland and mopey for hours then you are in, no actual acting ability is needed. This film starts of dull, gets even duller, gets mildly interesting and then ends in a massive anti-climax. The direction often felt lazy here, some of the camera movements are jerky and there seemed to be a lot of short pointless scenes that did not further the plot in any way at all, not that there is much of a plot to begin with. The characters of Bella and Edward did not improve at all, Bella is still painfully dull and Edward is overprotective to a creepy amount. Jacob is not an overly fantastic character, but he does make some scenes at least almost bearable with his friendly, fun-loving attitude (something which is otherwise unseen in the film). The lack of role models within this entire ‘saga’ of both books and films is very frightening considering the age and gender of its main fan base, which are ‘tweenage’ girls (11-13 year olds). These girls are at a very impressionable age and many of them unfortunately look up to the characters in this film. They see an almost constantly depressed girl who can hardly take one step unless a man is there to catch her, and a guy who is so protective of his girlfriend that he actually watches her sleep, all night... every night. Not only that but he tries to control her life. And when Edwards does break up with Bella what does she do? She get’s deeply depressed and takes to life-threatening hobbies, she all but commits suicide over it, yeah... not a fantastic role model for young girls but it’s thousands of fans seem to be blinded by shallow reasons. In the end there was one thing that impressed me somewhat about this film and that was the CGI wolves. I thought they looked good, the transitions from human to wolf was smooth, as was the texture and movements of the wolves themselves. Aside from the somewhat up to standard animation though, I really can’t think of one other high point of this film. Plot: A fairy tale set in Jazz Age-era New Orleans and centered on a young girl named Tiana and her fateful kiss with a frog prince who desperately wants to be human again. Cast: Anika Noni Rose, Bruno Campos, Keith David, Michael-Leon Wooley, Jennifer Cody, Jim Cummings, Jenifer Lewis. This film may not have had the same heart as the classic Disney’s but I feel that it was certainly a step in the right direction. The last traditionally animated set of films that Disney released were disasters’, slowly getting worse and worse such as the awful Home on the Range. So after all these years of computer animated releases I was worried how this new foray back into the medium would hold, would it be another disaster or have the charm of Disney’s original 2D films? I was mostly impressed with this piece, the story felt a little flat compared to some of the other Disney Princess films, which really, is quite worn territory but the characters here were strong, and often laugh out loud funny. The thing I really loved about this one though was just how outstandingly beautiful it was. They may have used the same technique of traditionally animating as the older films but there’s now doubt that this art form has advanced with the time, as Princess and the Frogis one of the most visually stunning Disney films to date. Almost every shot in this film was filled with vibrant colour and life, while different types of animation were mixed together to create interesting looks. As most Disney princess films this one was a musical, the songs however didn’t have quite the lasting effect on me as some previous Disney films but they were quite good in their own right. In the end though if it wasn’t for the amazing visuals in this film there wouldn’t be much here to carry it on. The only major difference is that it really looked amazing in blu-ray, the animation and effects were flawless. Yet when I saw it in the cinema in 3D it looked horrible and even unfinished at some points. Plot: After the death of Princess Diana, HM Queen Elizabeth II struggles with her reaction to a sequence of events nobody could have predicted. Cast: Helen Mirren, James Cromwell, Alex Jennings, Roger Allam, Sylvia Syms, Tim McMullan, Douglas Reith. I watched this film for the first time the other day with my Mum as it is one of the DVD’s from her collection. Now I must admit that my knowledge of the British Royal Family is embarrassingly low, so I found some of this confusing. For example, while watching this film I found it hard to understand how much was fiction and how much was true to what actually happened. I read afterwards that it was a work of fiction but while I was watching it could have been a retelling of true events for all I knew. This line between fact and fiction was blurred even more as many times throughout the film actual video-footage of the days following Diana’s death were shown. That being said though I did enjoy this film, it was a film with a very slow-pacing which may bother some people but I found it somewhat relaxing. 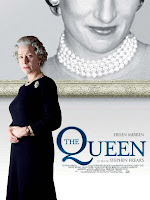 I thought that the way Helen Mirren portrayed The Queen was interesting, and maybe not what some people would expect of the Queen as she seemed to have more of an edge, yet also looked defeated in many scenes. It was also amazing to see how the Royal Family reacted to Diana’s death, and to Diana herself which quite surprised me. Although as this was apparently a work of fiction I’m not sure if that’s how they really reacted or not. In the end I did quite enjoy this film, I only wish they made it more clear whether these were accurate events or just a work of fiction tied into real events. Hmmm... more like a fictionalisation of very real events. In terms of a timeline, everything happened exactly as you see it. A degree of artistic license was taken to say how the Queen was feeling. The Queen is, by nature of her position, incredibly private. Many people don't understand that in these days when we know everything about any form of "celebrity". She has to be above such things. Diana died after a long and from her account, unhappy marriage. I think she referred to the Royal Family as "The Firm". Once she divorced Charles, she became a celebrity and the tabloids revelled in her affairs. Because Charles and The Queen were royalty, no-one ever really knows exactly what they thought. Many have assumed because of this, they didn't like Diana. And so when she died, protocol was observed and no official statements were made, leading to further accusations that the Royal Family didn't like her. The fact is, they are like any other family so far as relations are concerned and I believe the Queen was hit hard by the loss. Now Diana was the "Peoples Princess". The reaction to her death was staggering and so the Queen had to do something to show she did understand the feelings. Which the film showed as well as the pressure Tony Blair was under to referee, essentially. I was never a fan or voter of Mr. Blair, but he proved his worth during that strange time. I thought the film was very good at representing what were probably very true feelings for her. Great film. Thanks heaps for that Jon, I was hoping that one of our British members might help shed some light on this. So it seems the events that occured in the film were roughly spot on, with the Queens personality maybe the thing that is fictionalised more than most. I heard that the Queen herself watched this film. I wonder what she thought of it. I enjoyed The Queen very much as well. As for the fine line between fact or fiction? I believe that this film speculates to a certain degree the Queen's thought process during that difficult time based on what facts were known and from many third party assertions of people who 'claimed' to be in the know. Given the significant portion of her life that is very private no one can say with a convincing amount of certainty what went on in Buckingham Palace during that period save for the Queen herself. I agree with Jon that it was likely a fairly accurate account of the Queen's feelings. The film certainly comes to her defense in explaining the distant relationship between her and Diana and the misconceptions of the public who were convinced the Queen despised this darling of not only the British people but to much of the world. Great movie. Helen Mirren was destined for this role I believe. I also liked James Cromwell as Prince Phillip. I've always been a fan of Prince Phillip for as long as I can remember...his casual indifference to almost everything and his blunt, often embarrassing remarks he's made over the years make him a rather endearing character. I admire the way he speaks his mind. Plot: Oscar, an overlooked and bullied boy, finds love and revenge through Eli, a beautiful but peculiar girl who turns out to be a vampire. It’s so refreshing to see this type of vampire film within recent times. So much vampire nonsense is floating around at the moment that I was more than relieved to watch this film and witness the true essence of what makes a vampire, and what they have been in the past, which is essentially, monsters. I loved everything about this film, and was captivated from the silent opening credits to the closing moments of the film. The setting of the film was perfect, I actually couldn’t imagine this story playing out anywhere else except the cold barren land of Stockholm in the 80’s. While the film is very dark, it is aesthetically very… white. Most of the film is set within a snow covered landscape, with the end result being that I felt very cold while watching the film, despite being in a warm room. This to me proves just how involved I was in such an amazing story. The two lead actors in this film were amazing, especially Lina Leandersson, I don’t believe I have ever seen anything with her in it before but she completely stole the show for me. For such a young age she is a very captivating and established actor. I at times both feared, and cared for her character of ‘Eli’ in the film. It’s nice to see a film that really follows traditional vampire lore, yet tells it in such a new and original way that I never once felt like it’s “just another vampire movie”. Despite being rather violent in several scenes, I thought this film was beautiful, it was chilling and haunting, yet had heartwarming scenes scattered throughout. I highly recommend this to anyone, vampire fan or not. This is rather well liked around here (with a couple of reviews as well). I don't think there was any dissenting voice. I just watched this movie for the 2nd time in a few months and was curious to see if anyone had posted a review. I find your comments interesting Jon and I would tend to agree with you that it shows her true feelings for Diana but I don't think you and I agree on what those feelings were. You seem to be saying that the queen was saddened by Diana's death and that she finally broke with protocol to show people that she understood their feelings. I don't believe that. I think she finally did something because she was being accused of not caring by the whole of Britain. Not only she kept quiet until she was almost forced to react but she also denied Diana a royal funeral claiming that she was not royalty. I believe that she disliked Diana and wanted to show Britain (and the world) that she was a mishap in the royal history. I do agree that this movie shows how the Queen felt, especially when it shows her more concerned by the death of a deer, regardless of whether this really happened or not. There are several points to consider though, Eric. The first and most important is that if you believe the Queen truly disliked Diana, then it undermines her position somewhat. And considering her legacy and her efforts to modernise the monarchy, I can't believe that. For what reason would she truly dislike Diana, beyond poor choices post-divorce? If you look at the history, she would have more reason to dislike Charles! But the Royal family tends to lean on the bloodline and spouses drift to the side (just look at Phillip). Diana was very unusual in that she had the focus, not her husband. There is possibly a great deal of truth in the rumours of Charles' indiscretions. However I respect him and his work, so I can't even pursue that so far. When families break up, it is rather unusual for one side to hold a deep grudge and far more likely a sense of proportional disappointment. There is no way the Queen would ever have considered Diana a mishap, but she would genuinely worry for how the family is perceived as the marriage started to split. After all, she is the head of the Church and represents the British way of life. Divorce was surely annoying, but any sensible person sees it as needing two people to really screw up. In a nutshell, I suppose I'm saying that the Queen is possibly the most level-headed and consistent you could hope to have and I truly think she is above responding to base instincts of dislike and dishonesty. What absolutely did knock her for six is how the public reacted to Diana's death. Such a public outpouring of grief was completely at odds with Britain's history and to be blunt, I sympathise with her. I was saddened by Diana's death, but still, there should be a line and a huge number of people stepped way over it. The suggestion of a state funeral was merely pandering to the baying mob and not remotely sensible, or necessary. Because, and here I depart from the accepted theory, Diana was far from perfect. She was wonderful and the best ambassador this country will ever have. But she could also be petulant and even manipulative. She was not a Royal at the time of her death, so a state funeral was not required. If this was truly the Queen's view, then I fully agree with her. It doesn't reveal anything of her true feelings for Diana and I maintain, all things being equal, I believe she was compassionate. Just less so to the public's feelings as a whole. All you have to do is think about Sarah Ferguson. Fergie has done a lot to bring the Royal Family into disrepute, but mainly through clumsiness. She actually maintains a close relationship with her ex-in-laws despite everything. She differs from Diana in many ways, not least her ability to keep her mouth shut! But also she doesn't possess Diana's unique and natural charm that people were so enamoured with. So should Sarah die in a dreadful accident, God forbid, there will be no state funeral, unlikely even a ceremonial one. And no-one would ever question how the Queen reacted. Diana was special, but the Queen is sensible enough to see such things as equal and that's why she has endured as long as she has. As far as protocol demanded, she acted as anyone should have expected. Anything else would have been misplaced sentiment that would have left her wide-open for criticism in the future.